A trip to the veterinarian with my cat Ashley always started with her sudden disappearance as soon as she heard her carrier being brought upstairs from the basement. After a lengthy search, then forcing her into the carrier and loading my darling into the car, I knew what inevitably lay ahead. First, the preliminary howling, followed by Ashley’s urinating in the cage before I pulled out of the driveway. My routine with Ashley surely resonates with many pet owners. A pet’s anxiety of visiting the veterinarian begins before you even reach the clinic. 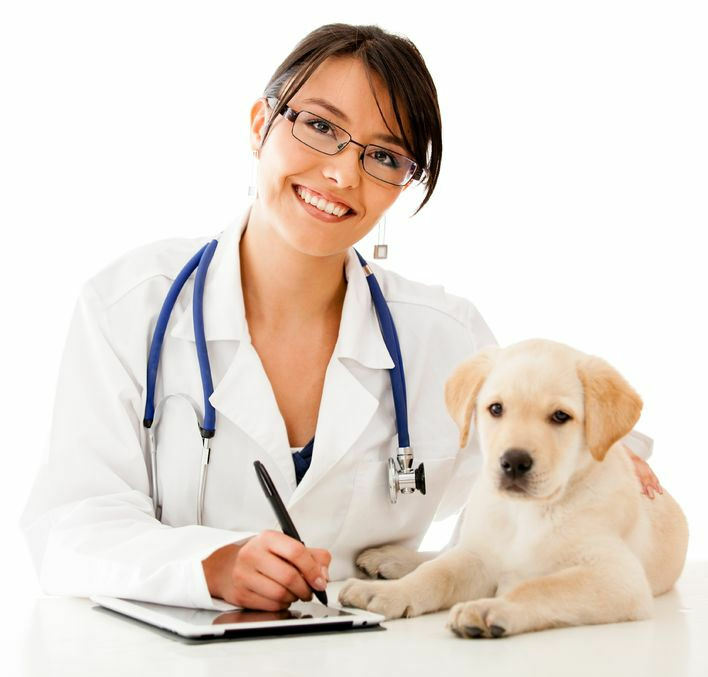 Because a pet’s first experience with a medical appointment is often for vaccinations, this can trigger a lifetime of fear and possibly cause the owner to avoid future and necessary trips to the veterinarian. Dr. Marty Becker, a veterinarian and nationally syndicated pet-care expert, established the Fear Free Initiativesm, which provides information and tools to veterinary professionals and pet owners for dealing with the dread of going to the animal clinic. His website (www.fearfreehappyhomes.com) includes helpful strategies to make veterinary visits less terrifying. It starts at home. Leave the carrier/crate out in areas used often by your pet when resting or playing. Place inside favorite toys, treats, or towels infused with pheromone (or catnip for a feline). Have the carrier close by during meals or playtime with your pet. Rather than forcing him into the carrier, allow your pet—months before a vet visit—to discover it and enter at will. Minimize the wait at the clinic. Make the appointment early in the morning, when the visits are less likely to be running behind schedule. Shorter time in the lobby can lessen anxiety in your pet (and additional stress for you). Place your cat’s carrier on a raised surface and cover the front and sides with a pheromone-infused towel. Depending on your dog’s preferences, you might wait in the vehicle or take a short walk. Allow plenty of time to avoid being rushed. Your pet can sense if you are stressed and become anxious. Speak in a low, calm voice rather than in a high-pitched sing song. Give your pet time to relieve himself before leaving your home. A full bladder or colon and no access to a bathroom will increase your pet’s discomfort. Go hungry and bring treats. Often the staff will have delicious little tidbits to offer your pet throughout the visit. Treats can serve as a distraction as well as a reward for cooperative behavior. Avoid feeding your pet a full meal before leaving for the doctor. This will not only make the treats more appealing but possibly prevent nausea during the car travel. Consider anti-anxiety or anti-nausea medication or commercially available fragrances. Discuss with your veterinarian about prescribing a sedative to soothe your pet before you leave your house. Also, many over-the-counter products are available in pet stores, such as pheromone sprays or oils that release calming fragrances into the air and on the central nervous system. Lavender has been shown to release a relaxing effect on dogs and cats. Spray the product on a towel or piece of clothing and allow it to dry 15 minutes before putting it into the carrier or on a bandana around your dog’s neck. Your pet is precious cargo. The most secure place for a carrier/crate is on the floor behind the passenger seat. While enroute to the visit, avoid abrupt or bumpy movements or sudden acceleration in traffic. Leave enough distance behind other vehicles to prevent sudden braking and approach turns slowly. When leaving the car, if the carrier is light enough, support the bottom with one arm and rest one side against your chest. Your pet will feel more stable, and you will lessen eye contact with other animals as you enter the clinic. Stay with your pet during the examination. Although some procedures may need to be performed in another area, ask the doctor if you can be present as much as possible, even for vaccinations. Gentle stroking or massaging (in the waiting area as well as the examining room) can ease the level of anxiety and comfort your pet. Of course, if you are uneasy with seeing any treatment, you should leave the room so that your pet will not sense your nervousness. Pay a friendly visit for treats and cuddles. Is the carrier used only for trips to the veterinarian? Is that the only time your pet rides in the car? Pets will associate these actions with feelings of dread. Occasionally make trips to the clinic for treats and cuddling by the staff instead of needle pokes and uncomfortable prodding. Some situations— such as fireworks, the sound of thunder, a guest or new pet entering the home, or a strange animal prowling nearby the house—will Inevitably arise, and we must deal with our animal companions being upset or afraid. But a visit to the veterinarian doesn’t have to be one of those times. A fear–free approach doesn’t guarantee your pet will never experience discomfort at the veterinarian—he may be in pain from injury or illness. But with some thoughtful planning and a touch of gentleness, you can lower the anxiety and stress caused by routine examinations and procedures. BIO: Carolyn is a volunteer at King Street Cats and enjoys being ruled by her two cats, Marigold and Butterbean. I have two cats that I need to take in to get spayed, and I really don’t want to ruin the idea of the vet for them by having a scary trip. They definitely can tell when I’m stressed, so planning lots of time to avoid rushing is definitely a good idea, and I’ll try to take them after they’ve already relieved themselves, as you suggest. Bringing them snacks will definitely make the trip more fun, too, and I know just the favorite treat to bring along. Many thanks for reading us. Trips to the vet are just as tramatic for us pet parents as it is for our furry pals. I have a 20 pound tuxedo cat who absolutely hates getting in the cat carrier….it’s quite the scene. Thanks for this advice for taking a pet to the vet. I’m glad that you mentioned it could be good to try to make sure you don’t wait too long in the lobby because it can lessen anxiety. It seems important to be punctual for appointments and know exactly when you should be there.